What is the biological role of aggresomes? Aggresomes are inclusion bodies that form when the ubiquitin-proteasome machinery is overwhelmed by misfolded and aggregated proteins. Typically, an aggresome forms upon exposure to cellular stress, such as viral infection, exposure to reactive oxygen species, and hyperthermia. Aggresomes, or aggresome-like inclusion bodies, sequester toxic aggregated proteins and thereby provide a cytoprotective function. Aggresome formation also facilitates the degradation of aggregated proteins by the autophagy-lysosome pathway. Homeostatic mechanisms, such as molecular chaperones and degradation of misfolded proteins by the ubiquitin-proteasome system, help to prevent the formation of protein aggregates. Why is it important to measure aggresomes in cells? Aggresomes play an important role in neurodegenerative disorders. Aggregates of hyperphosphorylated tau protein form Neurofibrillary tangles and β-amyloid aggregates form amyloid plaques, which are both associated with Alzheimer’s disease. Lewy bodies primarily consist of aggregated ubiquitin and α-synuclein and are seen in neurons of Parkinson’s patients. Mallory bodies are as associated with liver cells in alcoholic liver disease. In Huntington’s disease, a mutation in the Huntington gene leads to expression of mutated Huntingtin protein, which tend to aggregate and interfere with neuronal function. Being able to detect aggresomes in an authentic cellular context helps to better understand aggresome-related diseases. Detection of aggresome formation presents a valuable readout in the identification of compounds that inhibit aggresome formation and might play an important role in the treatment of neurodegenerative diseases. How can aggresomes be detected? Several approaches exist to detect aggresomes in cells. Transmission electron microscopy can be used as well as Polyacrylamide gel electrophoresis in combination with western blotting. Both methods are not suitable for high-throughput studies as they are very time-consuming and generate data that is difficult to interpret. Fluorescent microscopy can be used on labeled proteins whose aggregation can be studied after transfection into cultured cells. This method may limit the study depending on the number of labeled proteins that can be detected and might also influence the aggregation kinetics of the protein. For instance, the GFP protein (238 amino acids) is much larger than the β-amyloid peptide (39-43 amino acids) and may sterically hinder the formation of aggresomes. What are the advantages of PROTEOSTAT® detection? Our PROTEOSTAT® Aggresome Detection Kit provides a rapid, specific, and quantitative approach to identifying inhibitors relevant to neurodegenerative disease in an authentic cellular context. This fixed-cell assay does not require non-physiological protein mutations or genetically engineered cell lines. 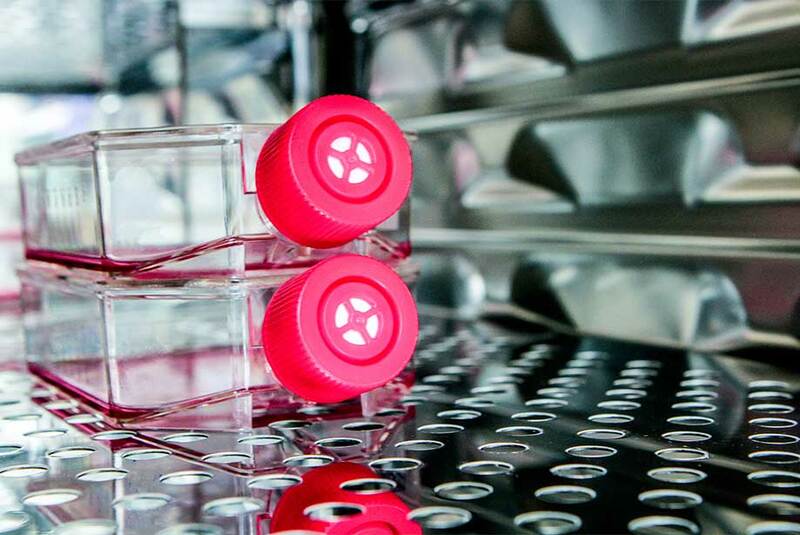 The PROTEOSTAT® Aggresome Detection Kit contains a novel 488 nm excitable red fluorescent molecular rotor dye to specifically detect denatured protein cargo within aggresomes and aggresome-like inclusion bodies in fixed and permeabilized cells. The PROTEOSTAT® dye has been validated under a wide range of conditions and with small molecule modulators, demonstrating suitability for screening compounds of potential therapeutic value, and optimized for antibody co-localization studies to identify interactions between aggregated protein cargo and the various proteins implicated in autophagy and aggresome formation. Figure 1. 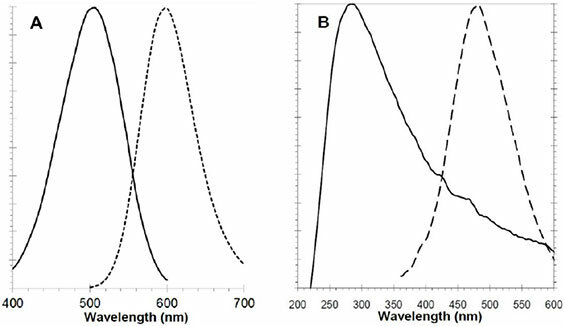 Excitation and fluorescence emission spectra for PROTEOSTAT® Aggresome dye, ex/em 500/600 nm (panel A) and Hoechst 33342, ex/em 350/461 nm (panel B). All spectra were determined in 1X Assay Buffer. Figure 2. PROTEOSTAT® aggresome dye detects protein accumulation within aggresomes, as observed by fluorescence microscopy. HeLa cells were mock-induced with 0.2% DMSO (panel A) or induced with 5 μM MG-132 (panel B) for 12 hours at 37°C. After treatment, cells were incubated with PROTEOSTAT® aggresome dye for 30 minutes. Figure 3. Cell Aggresome detected by PROTEOSTAT® dye co-localizes fluorescein-labelled antibody recognizing LC3I/II, as observed by fluorescence microscopy. HeLa cells were treated for 12 hours with 5 μM MG-132 on a slide and stained with (A) PROTEOSTAT® dye and (B) Fluorescein-labelled antibody recognizing LC3I/II; (C) composite image shown. Figure 4. Flow cytometry-based analysis. Jurkat cells were mock-induced with 0.2% DMSO or induced with 5 μM MG-132 overnight at 37°C. After treatment, cells were fixed and incubated with PROTEOSTAT® dye, then analyzed by flow cytometry without washing using a 488 nm laser in the FL3 channel. 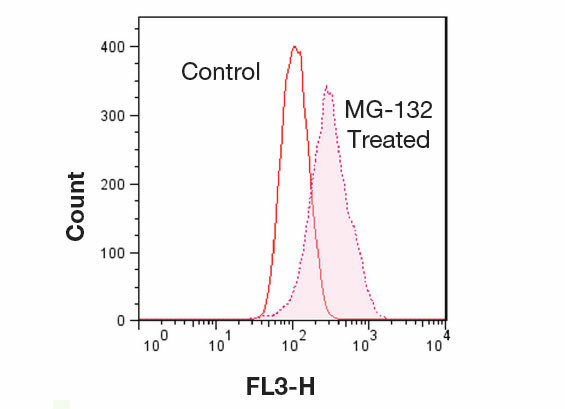 In MG-132 treated cells, fluorescent red signal increases about 3-fold. The described assay allows assessment of the effects of protein aggregation. Enzo’s catalog of widely cited and thoroughly validated products includes our PROTEOSTAT® assays for contamination monitoring, stability, aggregation, and process optimization. This kit has been designed for monitoring protein stability under systematic thermal stress conditions. Please check out our Neuroscience and Predictive Toxicology platforms for more information or contact our Technical Support Team for further assistance.